IT HASN'T been an easy time being the most recognisable faces of Carlton in season 2015. Mick Malthouse cops a weekly grilling from a media pack baying for blood. Then Chris Judd becomes fearful blood could actually be spilt when he is approached on a Melbourne street by an angry Essendon fan. But, while there has been hostility directed towards the two greats of the game, there are plenty of positive footballing vibes too, coming from where it matters most - Carlton headquarters, the aptly named Ikon Park. With Malthouse and Judd possibly in the final throes of their decorated careers, Tom Bell, the late-bloomer from Queensland, is relishing every moment spent with them. The 23-year-old is like a sponge when it comes to soaking up whatever advice the senior coach and former captain impart on him. "They are two icons of the game," Bell told APN. "It's an absolute honour to work under them, to be honest." First rookie-listed as a 20-year-old from Morningside, Bell spent one season at Carlton under Brett Ratten before Malthouse arrived. Admitting to having a "really good relationship" with 'Mick', Bell is an unabashed fan of the deep-thinking 61-year-old and remembers their first open and honest meeting. "He told me a few things I had to work on ... my kicking, and my speed," he recalled. "Early in my career I was getting caught holding the ball a little bit. "I think that's something that's really good with Mick - he's really open with the players. He tells them exactly how it is. There's no beating around the bush. "Mick's a great human. Hopefully I'll be coached by him for many more years." 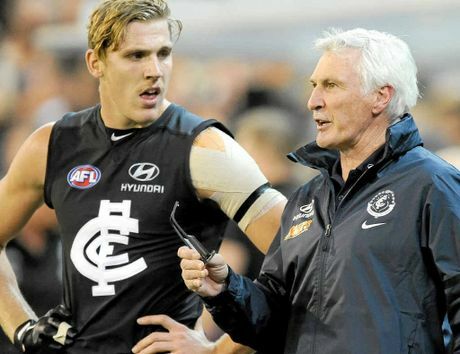 BELL TOLLS: Tom Bell at Carlton training and (inset) with senior coach Mick Malthouse. If Bell is any guide, it's hard to believe Mick 'lost' his players, as was speculated during a 0-3 start. And while tonight's game with Collingwood at the MCG will be only his 51st at the helm of the Blues, the players will be keen to provide him with a win in his record-breaking 715th in charge at VFL-AFL level. "It's an unbelievable achievement," 33-gamer Bell said. "It would be amazing if we could get a win for him." Judd has also had a major influence on the athletic Bell, who enjoyed arguably his best game last week, when booting four goals against St Kilda in Wellington. Having been mentored by the two-time Brownlow Medallist for the past three years, Bell said: "I enjoy working with him. He knows the game back to front. "He's obviously a gun of the AFL and someone I really look up to." Referred to by Bell as J-Man, Judd tonight comes in for game No. 275, after a less-than-ideal preparation that included being threatened by the Bombers fan. Bell says he's been "recognised a few times" by Carlton supporters, but is "thankful I haven't come across anything like that". "I like to lay low." In this current climate, who could blame him? "The ox is slow but the earth is patient." "Only he who does not fear death by a thousand cuts dares to unseat the emperor." "The meek may inherit the earth, but they will never win games of football."